If the winningest coach in NCAA men’s hockey history had the time, he’d gladly take hours to talk about former Boston College standout Chris Kreider. And he’d have plenty of material to draw upon. Now in his 47th season as a Division 1 NCAA head coach and 25th season as bench boss of the Boston College Eagles, Jerry York has seen some top-notch hockey players in his time. That long list would include the 27-year-old Kreider, now in his seventh campaign with the New York Rangers. As a freshman at Boston College in 2009-10, Kreider had a huge role in helping the Eagles to a national championship, scoring a goal in the title game against the University of Wisconsin. He also paced the United States to a gold medal triumph at the 2010 World Junior Championship, finishing with six goals and seven points in seven games. In 2011-12, Kreider netted 23 goals and 45 points to help Boston College win its second NCAA championship in three seasons, and then signed an entry-level contract with the Rangers on April 10, 2012. He made his NHL debut just days later in Game 3 of the Eastern Conference First-Round series against the Ottawa Senators. York constantly marveled at the forward’s commitment on the ice and in the classroom. With three 20-plus goal seasons and over 400 big league games played, the left wing has already put his name in the NHL record books. 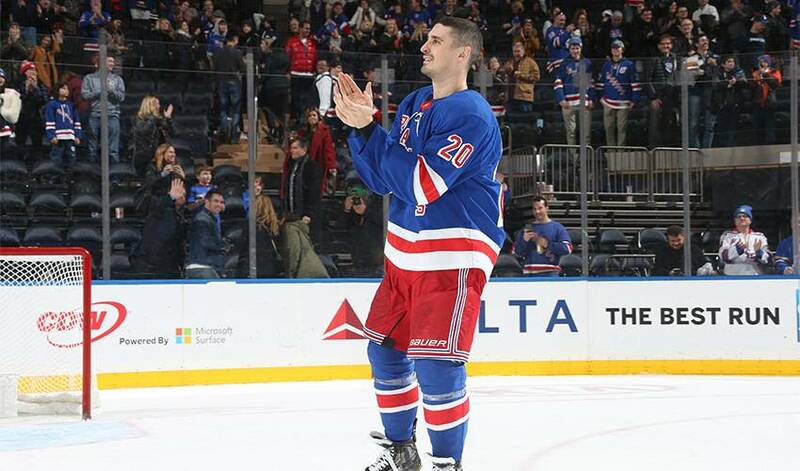 In 2012, Kreider finished with five goals and seven points in 18 playoff games, setting the standard for most playoff goals and points by a player who had yet to appear in a regular-season game. In 2014-15, he was the only player in the NHL with at least 20 goals, 40 points, a plus-20 rating and 80 penalty minutes. When time permits, York appreciates the chance to tune in and see Kreider (well on pace to best his career-high mark of 28 goals) excelling against the game’s best.